I went on little "accidental" shopping spree, this wasn't planned at all! I blame it all on one naughty blondie, she made me buy it. I wanted a new mascara for a while, as I've used up most of my old mascaras. I really wanted the Giorgio Armani Eyes To Kill Mascara, but there wasn't any Giorgio Armani stand. So we head up to the Dior stand and went a little crazy, two mascaras?! Well I will so need them. I had fallen in love with the Dior New Look mascara, the brush is so little, but so amazing at the same time, I love it! Although it's still too early to have a full opinion on it. 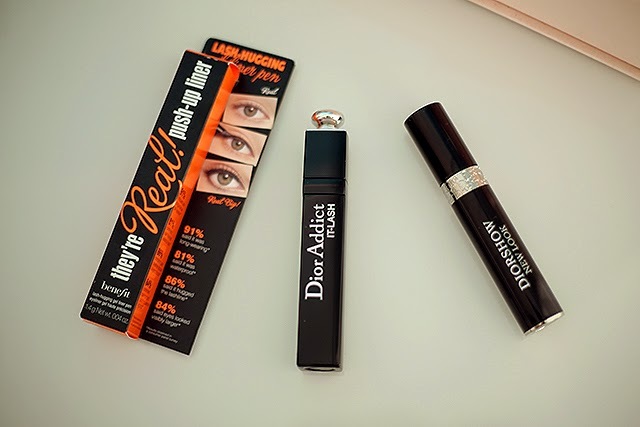 I haven't yet tried the Dior Addict It-Lash Mascara, I am not planning to open it for a little while, as I don't want it to dry out too quick. I seen so many videos and reviews on the Benefit They're real! Push up Liner, so I been craving it so badly! I must agree it's really waterproof, will be amazing for this hot sweaty weather. It's a nice matte black, so easy to apply. Can't wait till I will write a full review on it. Have you been naughty lately?